Last Sunday the clouds scattered, skies lifted, and the desire for a long walk led us to the Selkirk and Songhees walkways. From Victoria's protected harbour, a winding waterway, The Gorge, meanders inland. Along its shores residential and industrial buildings mix in relative harmony. Several bridges cross The Gorge Waterway, including our infamous Blue Bridge, soon to be replaced by another. Construction has been long and fraught with delays of one sort or another, but in a few months, the iconic bridge above will be replaced by a sleeker, modern version. Roses in January? How can that be? These were blooming in the shelter of shrubs. Such pretty blossoms for winter. 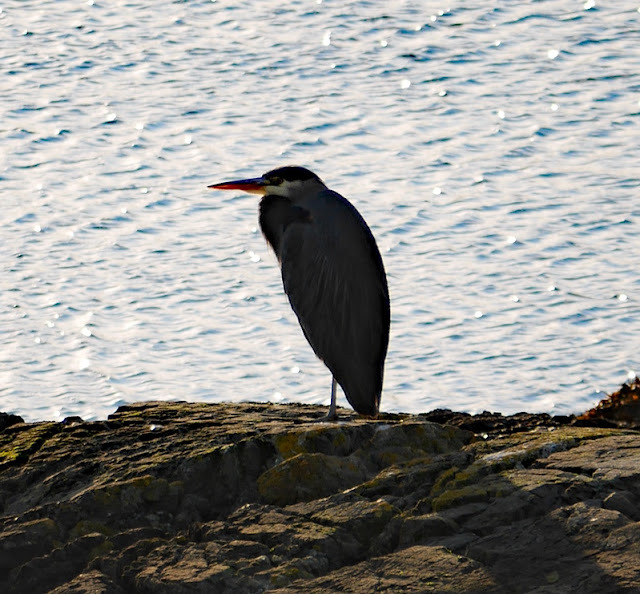 We saw many birds along the way, including Mr. Old Grumpy, aka Great Blue Heron. Others had the same desire for fresh air and when a woman coming from the other direction cried out, "oh look," I looked. From a stone wall above the walkway, a clump of snowdrops looked down on passersby. Cloud-streaked skies and delicate colours let us know that it was time to head back to the car, an hour away. Since Sunday, more rain has fallen, but have you noticed the days are noticeably longer? Such an interesting walk Lorrie - and seeing snowdrops this early gives one hope! The bridge is rather ugly and a 'sleek, new one" will be much more attractive I'm certain. Yes days are a smidgen longer I think however with the recent snow here everything has been very white since Wednesday's storm. It's been so beautiful though and is now almost melted and much warmer. I was able to sit on the front porch for an afternoon break and some fresh air today. There is nothing quite like the glimpse of the first snowdrops. Mine are appearing in the garden now. Pretty views on your walk. It's interesting how the days seem to grow longer more quickly than they grew shorter. I loved the many little surprises along your walk. Thanks for taking me along with you. Thank you for taking up on your walk. The views were simply lovely! Hugs to you, dear Lorrie! I've noticed how our afternoons are getting longer. The snowdrops are such a happy sign of early spring.The Victoria harbour is such a lovely walk. its been a mild winter generally so the I think that the roses are confused! I've enjoyed my walk with you, Lorrie! I feel the joy in the air, and yes, here in Alberta we've been noticing the days are getting longer too. Oh those snowdrops and that last photo...glorious! What a lovely winter walk, with lots of surprises! I, too, have noticed the lengthening days! Love your blooms of winter! And yes, I have noticed that the days are getting longer. You certainly took us on a beautiful stroll, what a delight to see the snowdrops so early. I enjoyed going along on your walk! That blue bridge is wonderful, I wish they would paint the new one that pretty blue. Do you know we have several things in common? I have a blue and white coffee cup (it's at work) that looks very similar to yours. We both journal and get a new one every Christmas, we sew and I have a black round table on my deck (I saw one very similar on one of your earlier posts, covered in snow). I've been off work 3 days because of the snow. It's 60 degrees today though, so I'll be returning tomorrow. descriptions that accompany the photos. I enjoyed seeing the Johnson Steet bridge again. I hadn't heard of the delays but certainly remember waiting to drive across it after hearing "T Johnson Street Bridge is about to go up" on the car radio. A winter walk is great but I'd guess that in today's windstorm you will be inside trying to keep warm. I wish there was a way to fix mistakes...I meant "The Johnson Street bridge is about to go up." Love that old bridge and enjoyed the walk with you in your cooler temps - here we are in a heat wave! It boggles my mind that you're seeing flowers already. We're experiencing a "wintermission" here so most of the snow has melted away. I'm also enjoying the longer days. Wonderful to have a break from wet winter days -- and to have flowers is even better. It won't be too much longer before I'll be envying your Spring flowers. Looks like it was perfect walking weather. Lorrie - Your pictures almost have me convinced Spring is right around the corner - the light, the flowers - but then I look at the calendar and am reminded that we have quite a bit of Winter ahead yet. Thanks anyway for letting me escape into Spring for a few minutes! Definitely, longer. Thank goodness. You are far ahead of us in anything spring related. Baked eggs...I find those so easy and good for breakfast company.